Let me introduce you to two of my closest, long-standing and most loyal “friends”: fear and anxiety. We’ve been “friends” for so many years, I’ve lost count. Like all friendships we have had our ups and downs – sometimes almost unbearably close, other times we have been apart for lengthy periods of time. In their absence, I have thrived, come out from their shadow. As comfortable as I think I feel in their presence, fortunately I do have a wide group of other friends which counter their hold over me: humour, a sense of fun (and the ridiculous), determination and happiness. I know there are millions of us out there who count these two amongst our nearest and (not so) dearest. Over the years, I have come to understand that it is these two which actually allow me to experience and appreciate their opposites in sharp relief. They have certainly shaped me, but will never define me. They have given me the ability to empathise with, sympathise with and understand others. I am a more rounded person because of them. Why am I telling you all this? Partly, I guess, because usually my writing is observational and light-hearted but not everything I observe is like this, life is more complicated, and partly in response to an article I read in The Times at the weekend about how you can deal with a child who worries incessantly, who is anxious, unable to relax. Not only did I recognise myself as that child, but also similar traits in my own children – particularly my eldest. It got me thinking…is this a trait peculiar to eldest children? Does that burden of responsibility that the eldest feels from such an early age allow a burgeoning relationship with anxiety and fear which to different degrees stay with you through childhood and adulthood? I am not just talking about obvious childhood fears, like monsters under the bed (although needless to say I had an veritable zoo under my bed as a child – snakes, sharks, lions, tigers – you name it, they were there – along with the whole cast of Ghostbusters). 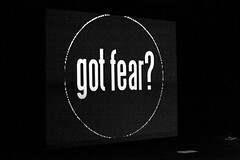 No, I am talking about those more intangible fears – fear of failure, fear of not living up to expectation (largely self-afflicted), fear of the unknown, fear about taking risks. In my experience, the second child, without the burden of forging the way like the eldest, feels a sense of freedom from responsibility and a freedom to take risks, throw caution to the wind, unencumbered by fear and anxiety. This is, of course, not to say that fear and anxiety are solely the preserve of the eldest child but in my experience, the eldest is far more cautious and less willing to take risks, more concerned about failure and the “what ifs”. It will come as no surprise then to you that I am the eldest of three children. My greatest wish for my children is that they do not allow my old “friends”, fear and anxiety, to determine their path in life. To that end, I try very hard not to allow my “friends” to stay in my house very often, especially when the kids are around. Just because something is familiar, it does not mean it is healthy or not to be challenged. The old adage of “familiarity breeds contempt” is certainly true as far as my old “friends” are concerned and I am finding as I get older (and wiser?) that I am moving away from this circle of “friends” and embracing my new friends – happiness, laughter and joy – much more. Now, I’m 40, I am also ready to discover new friendships – success (as I see it) and fulfilment of potential. I have realised over the year, that just because these two hanger-ons are familiar, that does not equate with being comfortable. Fear and anxiety are largely self-fabricated and built on no real foundations, just years of being allowed to co-exist. There is no real substance to them, you can just push them away if you really try. Fear and anxiety in a small measure are part of the human condition but you shouldn’t let them be your “friends”. Real friends make you feel good about yourself, boost you, laugh with you, cry with you and support you. Fear and anxiety are impostors – see them for what they really are. Stand up to them and watch them fade. Well, that’s my experience and that’s what I shall be telling my children.